Putin’s Puppet’s Pay Day ? WASHINGTON— Exxon Mobil Corp. XOM -0.69% has applied to the Treasury Department for a waiver from U.S. sanctions on Russia in a bid to resume its joint venture with state oil giant PAO Rosneft, according to people familiar with the matter. The waiver request is likely to be closely scrutinized by members of Congress who are seeking to intensify sanctions on Russia in response to what the U.S. said was its use of cyberattacks to interfere with elections last year. Congress has also launched an investigation into whether there were ties between aides to Donald Trump and Russia’s government during the presidential campaign and the political transition. Mr. Tillerson during his time at Exxon forged a close working relationship with Russian President Vladimir Putin and with Rosneft, a company that is critical to Russia’s oil-reliant economy. Exxon is seeking a waiver from U.S. sanctions on Russia to drill with Rosneft in the Black Sea’s Tuapse block. The State Department is among the U.S. government agencies that have a say on Exxon’s waiver application, which was made to the Treasury Department’s Office of Foreign Assets Control, according to current and former U.S. officials. Mr. Tillerson is recusing himself from any matters involving Exxon for two years, and won’t be involved with any decision made by any government agency involving Exxon during this period, a State Department spokesman said. Before he became secretary of state, Mr. Tillerson said Exxon opposes sanctions when they aren’t applied in a uniform way. He testified during his confirmation hearings that neither he nor his former company ever lobbied against U.S. sanctions on Russia. A spokesman for the Treasury Department said it doesn’t comment on waiver applications. An Exxon spokesman said the company wouldn’t discuss government deliberations on sanctions. Russia’s oil resources have long been among the most sought-after prizes by U.S. and European oil companies, and multiple U.S. presidential administrations in both parties have worked to help them enter the country. As much as 100 billion barrels of oil is believed to remain untapped in the country, but many Western companies have been stymied in their attempts to reach those reserves, often by geopolitical risks. 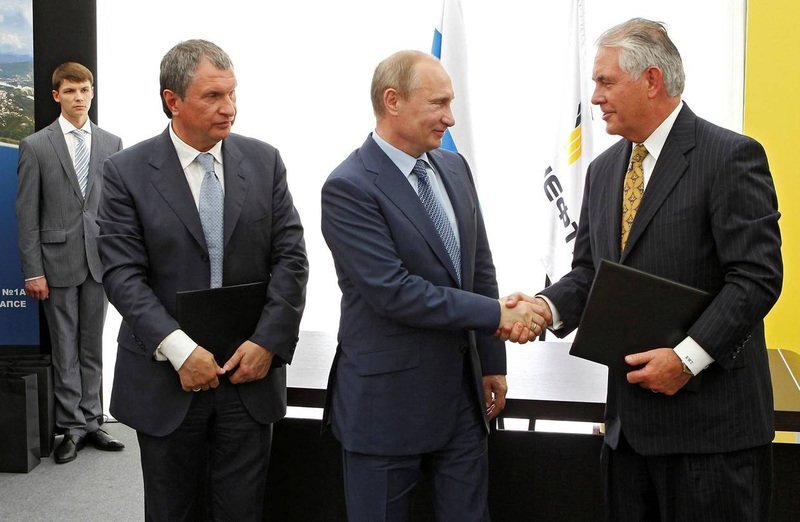 The sanctions effectively sidelined a landmark exploration deal Exxon, under Mr. Tillerson’s leadership, had signed with Rosneft in 2012. The deal granted Exxon access to explore in Russia’s Arctic waters, the right to drill with new technology in Siberia and the chance to explore in the deep waters of Russia’s portion of the Black Sea. Mr. Putin said Exxon and Rosneft might invest as much as $500 billion over the life of the partnership. In 2013, the Russian leader bestowed upon Mr. Tillerson the country’s Order of Friendship in part for his role in developing the joint venture. Exxon has reported it is exposed to losses from the Rosneft ventures of up to $1 billion before taxes, although the company has yet to recognize them on its books given its position that sanctions could be lifted. Exxon received a U.S. waiver in September 2014, when the sanctions were first implemented and the company was working on a well in the Russian Arctic. Mr. Tillerson and other Exxon executives asked the Treasury Department and senior Obama administration officials to allow the company to complete the well, saying it wouldn’t be safe to leave before it was finished, according to people familiar with the matter. Treasury granted an extension, and the company completed drilling in October and eventually withdrew its employees from the project. Exxon has disclosed that in 2015 and 2016 the company received a license from the Treasury Department allowing the company to undertake “limited administrative actions” in its partnership with Rosneft, according to company documents. Such permission would put Exxon in a position to move more quickly if it gets the green light to drill, according to the person familiar with the matter. Exxon’s proposal to drill in the Black Sea has been circulated in various federal departments in recent months, several people said. Exxon is arguing that it deserves a waiver there because under its deal with Rosneft its exploration rights in the Black Sea will expire if it doesn’t act, and because some of its top foreign competitors aren’t similarly restricted. It is unusual for a company to seek a waiver based purely on future business prospects, according to former U.S. officials. American companies often seek waivers from sanctions citing humanitarian, trade or operational issues, the officials said. Rep. Adam Schiff, the senior Democrat on the House Intelligence Committee investigating Russia’s role in the 2016 U.S. presidential election, called on the Treasury to turn down Exxon’s request.